Sorry about letting this blog go down the pipes, large fan base. If theres anything I despise it's a lazy blogger with bad grammar, so I have a hard time brushing my teeth in front of the mirror now. Anyways, let's see if we can kick start this blog in the new year with all new articles, opinions and fake news designed to keep the rest of the blogging community on it's toes. 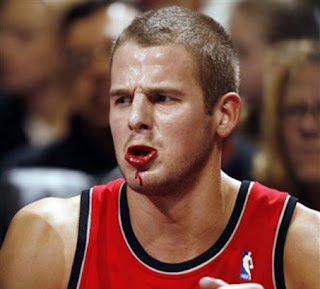 In our most recent news flash, Joel Pryzbilla didn't actually injure his knee last night, he just got popped in the chops and had be carried off the court on a stretcher, so he could get some kleenex to mop up all those tears and blood.